The mysterious disappearance of (James Riddle) Jimmy Hoffa is one of the cases which authorities have not been able to solve, However this case is no longer a Mystery anymore, the solution of this case was quite shocking. His real name was James Riddle. He served as the General President of the International Brotherhood of Teamsters, he disappeared on July 30 1975 and he was never found anymore. His wife saw him for the last time when he left his house in the suburbs of Chicago to attend a meeting with the gangster Anthony "Tony Jack" Giacalone, former vice-president of the Teamsters. Two witnesses declared that they saw Hoffa at the restaurant Machus Red, in the small city of Bloomfield, Michigan, around 3:30 PM. Nobody has seen him ever since. Ruanel: This case is very simple, directly he was victim of an attack by a group of gangsters because the campaign he was making was not convenient to them. Interlocutor: Who were in that group? Ruanel: The group was composed by close people of him who pretended to be his friends, and in a scheduled lunch they didn't agree in certain issues and then they decided to make him disappear. Interlocutor: Are we speaking of the mafia capo Anthony Giacalone? 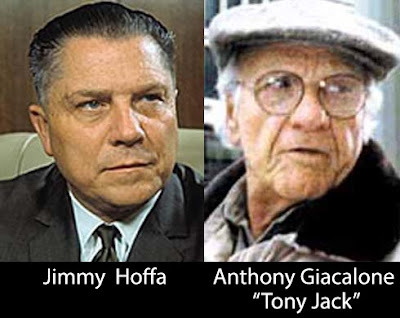 Interlocutor: Was Hoffa murdered the same day he met with Giacalone? Interlocutor: Where was he buried? Obviously if it’s possible for us to know. Ruanel: They made him disappear by cremating his body. Then they threw the ashes to the near river. Interlocutor: And is this the whole history? Ruanel: That’s right. It’s the only way to make a body disappear so that there is nothing left of him. Interlocutor: I am astonished by the conspiracy of silence around this crime, because nobody opened the mouth. Ruanel: Well, there were journalists who investigated, they came close to the truth and they were silenced. Interlocutor: Were they Murdered or they bought their silence? Ruanel: Two of them were murdered. Interlocutor: Is it true what those two witnesses said that Hoffa was at the restaurant Machus Red, in the city of Bloomfield, Michigan, around 3 o’clock in the afternoon? Ruanel: Yes, it is true. Interlocutor: So it means that they killed him that same day. Interlocutor: Where was he cremated? In a bakery? I ask it because in all the movies about mobsters they always make the bodies disappear in a bakery oven. Ruanel: No, it wasn’t in a bakery oven, but in a car workshop. Ruanel: No, there is no need to give more details. This entry was posted at Monday, August 17, 2009 and is filed under assassinations . You can follow any responses to this entry through the .